Baca designed & developed the Blue Infrastructure toolkit, which constitutes one of the three main outputs of Suttons Climate Adaptation Action Plan. Commissioned by the London Borough of Hackbridge, this guidance became adopted policy in 2012 as part of the Borough’s Climate Adaption Plan. The aim of the ‘Blue Infrastructure Toolkit, is to help manage and reduce unacceptable levels of flood risk, by raising awareness and aiding the delivery of more sustainable development.The toolkit adopts an integrated design approach which aims to provide new mixed-use development built to zero carbon standards, whilst simultaneously managing flood-risk through resilient spatial planning. The toolkit allows quick assessment of flood-risk to sites in Hackbridge and high-level guidance on what development use and type may be appropriate based on vulnerability zones. The toolkit is accompanied by ‘Vulnerability Maps’ that charts two sources of flooding – Rivers (Fluvial) and Surface Water (Pluvial). Data Sheets accompanying the toolkit. Each data sheet provides a reference table to identify which uses (such a industrial, commercial and residential) would be appropriate based flood zones classified on the vulnerability maps. 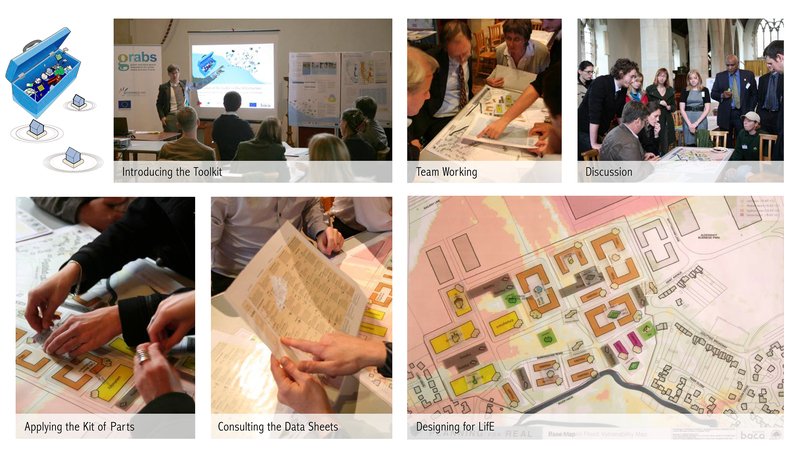 The toolkit methodology is a transferrable planning tool on sites that are at flood risk. It is to be used by decision makers, designers and developers before and during the early stages of design. This toolkit adopts an integrated design approach pioneered in the Defrafunded Long-term Initiatives for Flood-risk Environments (LifE) project (June 2009), to simultaneously address, the need to accommodate new mixed-use development and to manage flood risks through resilient spatial planning whilst achieving zero carbon standards.